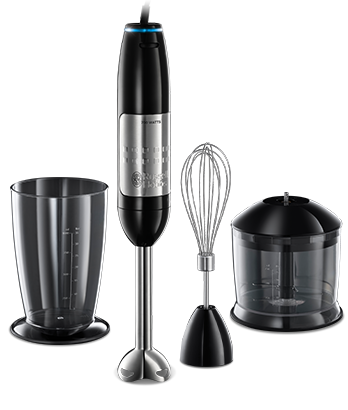 The Illumina 3-in-1 hand blender comes with a capacious 1000ml beaker, whisk and a 750ml chopping bowl. This makes it ideal for blending, whipping, chopping, pureeing and a variety of other kitchen tasks. It has a stainless steel blending leg with titanium coated stainless steel blades, which are 4 times harder than uncoated blades*. Easy to use, easy to clean, its stunning modern design will look good on any work surface. It’s also easy to see how the sophistication of the Illumina 3-in-1 Hand Blender lies in the simplicity of its unique Colour Control technology.